WASHINGTON -- I can't breathe. Those were Eric Garner's last words, and today they apply to me. The decision by a Staten Island grand jury to not indict the police officer who killed him takes my breath away. In the depressing reality series that should be called "No Country for Black Men," this sick plot twist was shocking beyond belief. There should have been an indictment in the Ferguson case, in my view, but at least the events that led to Michael Brown's killing were in dispute. Garner's homicide was captured on video. We saw him being choked, heard him plead of his distress, watched as no attempt was made to revive him and his life slipped away. This time, there were literally millions of eyewitnesses. Somebody tell me, just theoretically, how many does it take? Is there any number that would suffice? Or is this whole "equal justice under the law" thing just a cruel joke? African-American men are being taught a lesson about how this society values, or devalues, our lives. I've always said the notion that racism is a thing of the past was absurd -- and that those who espoused the "post-racial" myth were either naive or disingenuous. Now, tragically, you see why. But he wasn't assuming a submissive posture as quickly as the cops wanted. Officer Daniel Pantaleo placed him in a chokehold, compressing his windpipe -- a maneuver that the New York Police Department outlawed two decades ago. Garner complained repeatedly that he was having trouble breathing. The officers wrestled him to the sidewalk, where he died. An emergency medical crew was summoned but officers made no immediate attempt to resuscitate him. The coroner ruled Garner's death a homicide. 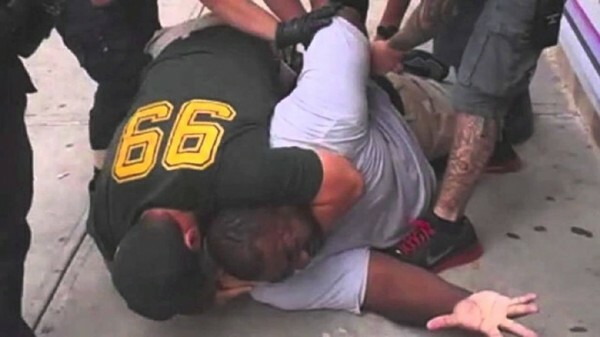 He suffered from asthma, and Pantaleo's chokehold killed him. This travesty -- there's no other word for it -- came just nine days after a St. Louis County grand jury declined to indict Officer Darren Wilson for Brown's death. Demonstrators took to the streets across Manhattan. What else was there to do but protest? Set aside the signs that say "Hands Up, Don't Shoot." Bring out the signs that say "I Can't Breathe." There are two big issues here. One involves the excessive license we now give to police -- permission, essentially, to do whatever they must in order to guarantee safe streets. The pendulum has clearly swung too far in the law-and-order direction, at the expense of liberty and justice. As I wrote Tuesday, we are so inured to fatal shootings by police officers that we do not even make a serious effort to count them; the Michael Brown case illustrated this numbness to the use of deadly force. Garner's death is part of a different trend: The "broken windows" theory of policing, which holds that cracking down on minor, nuisance offenses -- such as selling loose cigarettes -- is key to reducing serious crime. The other big issue, inescapably, is race. The greatest injury of the Brown and Garner cases is that grand juries examined the evidence and decided there was no probable cause -- a very low standard -- to believe the officers did anything wrong. I find it impossible to believe this would be the result if the victims were white. Garner didn't even fit into the "young black male" category that defines this nation's most feared and loathed citizens. He was an overweight, middle-aged, asthmatic man. Now we're told that the man who killed him did nothing wrong.